It is one of my Golden Rules of Filmmaking: A Movie That is Part III Usually is A Disaster or a Harbinger of a Greater Disaster. For the first part, see X-Men III: The Last Stand, Spider-Man III, and The Godfather Part III. For the second, see Batman & Robin and this film: Superman IV: The Quest for Peace. I can't fault their good intentions, but good intentions don't lead to a good film. This for me is THE FILM that began one of my greatest pet peeves in movies: being lectured to. Even when I saw this as a child, I knew I was being lectured on something, and ever since then, I've hated films that I suspect are made more to promote a cause than to entertain on some level. What went wrong? How could this film have been spawned by Superman: The Movie, which IS the Citizen Kane of comic book film adaptations? Well, I might have another rule: when the star of the film comes up with the story, chances are we're in for a vanity project of some kind. That might be unfair to Christopher Reeve, who didn't come up with the story of Superman IV as an ode to himself. Rather, Reeve wanted to share the importance of his thoughts about nuclear disarmament. He meant well, and his sincerity about how we need to stop making nuclear bombs is admirable. However, in his own quest to use the Superman franchise to further his own ideology, he forgot to put it in the context of a good story. Some things were out of his control, some things weren't. If I am honest, this is not a review of Superman IV: The Quest for Peace. It's an autopsy. 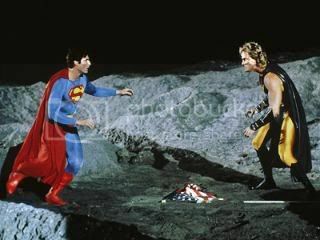 At a brisk 90 minutes, Superman IV is the shortest of the Christopher Reeve Superman films and the second-shortest in the entire franchise (running about a half-hour longer than Superman & The Mole-Men). However, even in that hour and a half, Superman IV feels all that longer as we watch people just embarrass themselves in the cheap production, boring story, and tired retreads of previous films. Clark Kent (Reeve) has found another Kryptonian crystal, all that remains of that now-lost world, in the barn of the Smallville farm he grew up in. Later on, Lex Luthor (Gene Hackman) has escaped his hard-labor camp with the aid of his hereto-unknown nephew Lenny (Jon Cryer, in an obvious nod to the youth market...when you look to appeal to teens, you turn to Ducky). Lex has decided to destroy Superman by creating his own super-powered villain, Nuclear Man (Mark Pillow). Meanwhile, David Warfield (Sam Wanamaker), owner of sleazy tabloids, has bought The Daily Planet, much to the anger of editor Perry White (Jackie Cooper), photographer Jimmy Olsen (Marc McClure) and ace reporter Lois Lane (Margot Kidder). Warfield has put his daughter Lacy (Mariel Hemingway) in charge of the paper and to bring up circulation, but the only thing Lacy wants to bring up is Clark's...well, she is immediately attracted to Clark and does what she can to bring him into her world. Hilarity is suppose to ensue. However, Supe has other matters on his mind. A little boy, Jeremy (Damian MacLawhorn) has the perfect solution to solve the failed nuclear disarmament talks: get Superman to get rid of all nuclear weapons. Superman struggles a bit with this question, even jumping off the roof with Lois and revealing his identity (again) flying her around the world (again) and kissing her off to where she forgets it all (you guessed it...again). With that, he goes to the United Nations and declares that effective immediately, he's going to rid the world of all nuclear weapons (and said world rejoices). Lacy continues her own quest for piece...a piece of Clark Kent, and more hilarity ensues when Lacy and Lois try for a double date with Clark and Lois. Luthor, now with an eye for war-mongering/profiteering, puts a device in one of those nuclear weapons. When Superman throws into the sun, it creates this new villain. His power is to grow deadly fingernails that will make Superman mortal and weak. Eventually they do confront each other and Nuclear Man manages to weaken the Man of Steel. With him out of the way Luthor rearms the world. However, that little crystal will save Superman's life. ...but Superman comes to the rescue and finally gets Nuclear Man out of the way. One thing Superman can't do is solve the nuclear question. He informs the world that he's tried but that it's not up to him. It's up to us, and until the people of the world so want peace their governments will be forced to give it to them, he'll keep trying. He captures a fleeing Lex and Lenny, taking the former to prison and the latter to Boys Town, Metropolis. No matter how you break it down Superman IV is a disaster. In fairness to Reeves not everything wrong with Superman IV comes from his well-intentioned mind. A great deal of the blame falls to Golan-Globus, the producers a friend of mine sarcastically refers to as "the Citizen Kane of production companies". Menahem Golan and Yoran Globus didn't just cut corners in production; they shredded the whole page. Few films look so cheap on screen as does Superman IV. The visual effects in particular were galling. Superman had set such high standards for visual/special effects it's truly sad to see Superman IV make them so cheap if not downright stupid and embarrassing. At certain points, one can see the strings pulling Nuclear Man, and every time Superman takes flight, it's painfully obvious he's in front of a screen. In his first flight to rescue Lois from an out-of-control subway, you can see Reeve's Superman superimposed onto filmed footage (and I think it was the same footage as when Lois and Clark were at the subway station). What is suppose to be a romantic flight between Lois and Superman around the world looks equally cheap. In fact, so much that is wrong in Superman IV comes from the fact that it just looks so cheap. A particularly galling sequence is when Superman speaks to the United Nations. That entire sequence is something that should be shown to film students in the class "Don't Let This Happen to You". I'll get to what makes it wrong in a contextual form in a bit, but let's stay with the money aspect first. Now, at the time of Superman IV I had yet to visit New York City, but was aware of what the General Assembly looked like. Having since visited New York City twice, it makes the shameless lack of similarity all the more apparent. The General Assembly in Superman IV looks like a large rented hall rather than a center of world leadership, and the fact that the set is so cheap and unconvincing is only the beginning. Apart from the fact that the General Assembly looks nothing like the actual General Assembly, the film made one ghastly mistake after another. A street directly in front of the entrance (which it doesn't have). The same people dressed in 'native costume' both in the lobby and in the assembly (how they got into the hall faster than Superman no one knows). "England" as a member state! This one is the most appalling and lazy of the mistakes in just this one scene. There is no way "England" can be a U.N. member. The correct designation would be "United Kingdom", but given how inept Superman IV is, perhaps this mistake is the most forgivable...even if it is the most illogical. One can tell just how little money was spent whenever one sees it. The models used (like the Great Wall of China or what I figure is Mt. Vesuvius) were painfully amateurish (makes the Classic Doctor Who visual effects almost Lord of the Rings-like in comparison). The 'American' Daily Planet newspaper's headline reads, "New Publisher for Your Favourite Newspaper" (emphasis mine). Allowing Gene Hackman to keep his natural hair rather than the wigs the suppose-to-be-bald Lex Luthor should have. Now we can turn to the script, which Reeve can be blamed for. Christopher Reeve was a good, solid liberal. Nothing wrong with that. He decided that Superman IV would be the perfect place to spread the word about the dangers of nuclear proliferation. Again, he meant well, but it doesn't make sense (except in a liberal's mind) that the world would be cheering on someone coming in and unilaterally disarming the world. The world leaders at the U.N. would more likely have gasped at the thought and might have raised objections to having someone, even Superman, electing to take warheads launched at tossing them into the sun. IF Superman had opted to be an honest mediator in talks, THEN things might have been believed, but it all makes one suspicious that despite all good intentions Superman IV was being used as thinly-veiled propaganda for the nuclear freeze movement. Whenever a fictional character starts taking sides on something, it runs the risk of being more of a lecture than of entertainment. Even worse, I'm amazed that neither screenwriters Mark Rosenthal and Lawrence Konner (from a story by Rosenthal, Konner, and Reeve) or director Sidney J. Furie failed to notice that the U.S. President and the Soviet Premier were giving virtually the exact same speech! If you listen to both of them, you'll hear that it is basically a verbatim copy of what the other said (with the only real change in the end). It was the laziest way to write a story (and that's not including howlers like when Superman attempts to stop Nuclear Man's rampage by shouting, "Stop! Don't do it! The People!" All that was left for him was to ask, "Think of The CHILDREN!"). The lowest point in Superman IV has to come when Nuclear Man, obviously bored with nothing to do, decides to take "the woman". 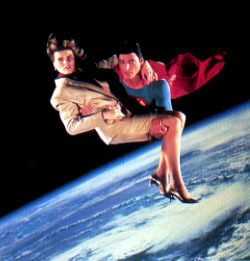 He sweeps her into outer space where once Superman moves the Moon to block his energy, she is about to fall into space. Even as a child, I thought that didn't make any sense. Wouldn't she have, well, exploded when leaving the atmosphere? There's no oxygen for her to breathe...how can she survive so well in outer space? Even the film makes obvious this is patent nonsense: we begin Superman IV with a group of cosmonauts in space suits. Are we seriously being asked to accept that Russians need spacesuits but American newspaper editors (hot as they are) don't? While Hackman didn't embarrass himself, maintaining the mixture of comic and dastardliness that made him such a good Luthor, almost everyone else couldn't be helped. Hemingway actually didn't do too bad, though the evolution from ruthless corporate lackey with the hots for Clark Kent to a genuinely caring woman more interested in news than profits was rather quick (even for a short film like Superman IV). Reeve's Superman was still strong even if he did now come off as preachy. However, Cryer's Ducky...I mean, Lenny made Otis look like a MacArthur Genius Grant winner, with his vaguely Valley Girl speech and general uselessness. Why Jon Cryer was chosen to be the 'young' character I'll never understand. Superman IV has an embarrassment of embarrassments. In certain aspects, it was a sad retread of Superman and Superman II (the flight between Lois & Superman and the 'magical kiss', Luthor's threat to blow up a building to bring Superman to his lair) and even Superman III (the villain's efforts to enrich himself by manipulating the world, the excess of comedy with the 'double date' which ultimately went nowhere). 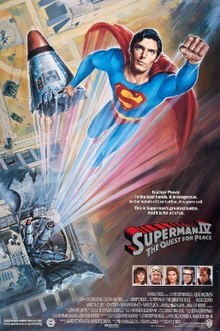 Given how Superman set the standard for ALL superhero films, not just Superman films, Superman IV: The Quest for Peace is just more than bad...it's sad, sad to watch. Curiously enough, the last line in Superman IV was when The Man of Steel told Lex Luthor, "See you in twenty." By a strange twist of fate, it would be almost twenty years (nineteen to be precise) before another Superman film came our way. I'll be honest: I don't think this is the best review for Superman IV: The Quest for Peace; that honor goes to Lana Lang herself. In the documentary Look, Up in the Sky!, Superman III co-star Annette O'Toole said, "I didn't even see....WAS there a Superman IV?"